Notice that if we make another trapezoid which has the same size and shape as above, flip one trapezoid, and make one pair of the non-parallel sides meet, we can form the figure below. That figure is a parallelogram. Can you see why? Now, observe that the base of the parallelogram from the figure is a + b. 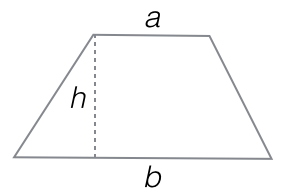 Its height is h.
where a and b are the base (parallel sides) and h is the height. *Please take note that there are other definitions of this polygon. In some books, it is defined as polygons whose at least one pair of sides are parallel. What is the area of a trapezoid whose base are 12 cm and 18 cm and whose height is 15 cm. Using the notation above, in this problem we have , and ? So, the area of the trapezoid is 225 square units. In the next part of this series, we will have more examples on calculating the area of a trapezoid.